New to climbing? Want to meet some climbing buddies? Or just looking for a way to get out on some natural rock? 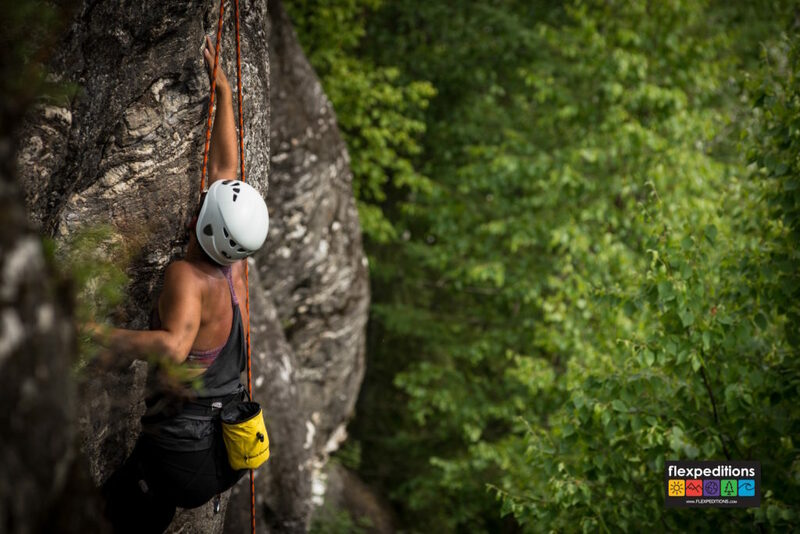 Our rock climbing tours are for you! We work in partnership with local, professional ACMG and TRCI guides for rock climbing and alpine hikes. They will introduce you to the surrounding rock at Revelstoke, BC. Our rock climbing tours cater for a variety of individuals; they are ideal for beginners who have never climbed before, those who have a general idea of climbing but need a bit more instruction to build confidence, and those who have the experience but lack the equipment or transport to enjoy their hobby to the full. Snacks, gear, professional guide, and shuttle transport (if needed) is included. Please call +1 (866) 929-3539 or e-mail info@flexpeditions.com for prices and bookings. If you are a large group of 6-12+ participants we can offer a group rate, contact us to discuss this. A minimum of 2 climbers is required for the session to run. We have set courses and camp dates, but climbing is available upon request when the minimum numbers are met - or you can book a private climbing day for a little more. Do you guys know what you're doing? Absolutely! We use local and professional certified ACMG and TRCI guides. They are from the professional association of trained and certified mountain, hiking and climbing instructors, so trust us, you are in safe hands! What's the big deal about climbing in Revelstoke? 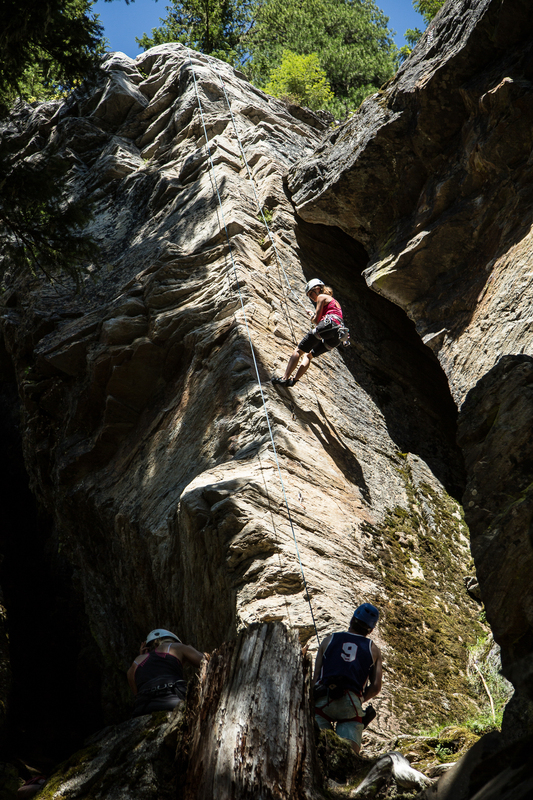 We believe that Revelstoke has some of the best climbing in the whole of Canada. It boasts 14 climbing areas within easy driving distance, 46 well-developed cliffs and over 300 different routes. The scenery that goes along with these cliffs is simply stunning. What are we going to learn and do? We cater to the groups current experience. You will learn about climbing safety, tying the re-threaded figure of eight knot, how to safely belay and, not to forget, you'll also climb a whole bunch! We will give you pointers to improve your climbing technique and help you push your grade. It'll be a blast! What do I need to wear and bring? All gear is included, but feel free to bring your own personal gear along if you have some of your own! Sure! Our instructor will inspect your gear and you can choose to climb in the comfort of our gear or your own! Where do I meet you? The meeting point will be in the town of Revelstoke and will be specified by your guide once you have booked. Are there any special rates? For group bookings of 6+ people we will offer a special rate and a customised package. Please enquire for details. How old do I have to be to climb? For our daily climbs we bring people who are 14+. If you have a family that's keen to climb we can take climbers 5+ with their parents or guardians. We also offer climbing camps for 5-10, 11-13, teen climbing camps and courses for adults. Are there climbing camps for kids? Yes - click here to check out our climbing camps and other camps for kids! Sign up by June 1! Do you offer any climbing courses? Yes! We offer courses for absolute beginners, intermediates, kids, and climbers wanting to learn lead climbing. Check out our climbing courses by clicking here. 24-hours notice minimum needed to guarantee activity spot. Last minute requests may be accommodated based upon guide availability.